CDBG Entitlement Program provides annual grants on a formula basis to entitled cities and counties to develop viable urban communities by providing decent housing and a suitable living environment, and by expanding economic opportunities, principally for low- and moderate-income persons. 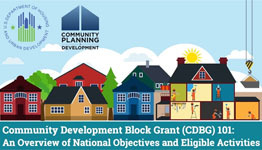 CDBG State Program allows States to award grants to smaller units of general local government that develop and preserve decent affordable housing, to provide services to the most vulnerable in our communities, and to create and retain jobs. CDBG HUD Administered Non-Entitled Counties in Hawaii Program provides annual grants on a formula basis to Hawaii, Kauai, and Maui counties to provide decent housing and a suitable living environment and expand economic opportunities, principally for low- and moderate-income persons. CDBG Insular Area Program provides grants to four designated insular areas: American Samoa, Guam, Northern Mariana Islands, and the U.S. Virgin Islands to provide decent housing and a suitable living environment and expand economic opportunities, principally for low- and moderate-income persons. CDBG Program Colonias Set-Aside requires the border states of Arizona, California, New Mexico and Texas to set aside a percentage of their annual State CDBG allocations for use in the Colonia to help meet the needs of the Colonias residents in relationship to the need for potable water, adequate sewer systems, or decent, safe and sanitary housing. Section 108 Loan Guarantee Program is the loan guarantee provision of the CDBG Program and provides communities with a source of financing for economic development, housing rehabilitation, public facilities, and large-scale physical development projects. The Neighborhood Stabilization Program provided grants to communities that suffered from foreclosures and abandonment to purchase and redevelop foreclosed and abandoned homes and residential properties. Congress authorized NSP grants between 2008 and 2011; no new funds are available. Access a listing of CDBG grantees in a particular state. This collection of online technical assistance products will help grantees: create transformative impact in your community, improve the lives of all residents, and especially those with low and moderate income levels; develop strategies that bring partners and resources together, leveraging and building community assets; and implement your program effectively, increasing the likelihood of successful projects. For additional Community Development resources, visit the Community Development pages on the HUD Exchange. CDBG Toolkit on Crosscutting Issues - designed to provide Entitlement and State grantees, as well as sub-recipients, with information on crosscutting regulations that apply to the CDBG program. The Toolkits cover five disciplines--financial management, environmental review, federal labor standards, acquisition/relocation, and fair housing and serve as a resource guide for grantees.